Things were a little too murky, even for a lobster’s taste. Mollusk trading was down. The price of plankton was skyrocketing. Anemones were foreclosing left and right. Burrowing the day away just wasn’t cutting it any more – old Crusty needed a getaway. He lifted his head out of the bottom of the cold North Atlantic Ocean. His wife of 50 years poked her antennae up to get a better listen. “Yes, dear. Why not?” He looked over at Lily. Her head popped up creating a granule storm that slowly dissipated around her beady black eyes. She was still the same Lily he had met by the shore so long ago, just a bit longer and heavier from the cruel passing of time. Crusty figured she must be close to 30 pounds by now. He was edging there himself. On the other side of the reef, the ladies at Invertebrate Holidays were incessantly clicking their claws, waiting for the phones to ring with nearly no patience remaining. It had been the longest, dreariest of days with not one trip booked! Not one Molten Holiday or Caviarmoon. Not one guided Shallow Seas tour or the ever-popular Crustacean Cruise. “We might very well have to close our doors if things don’t pick up real soon,”said Trixie, with a sigh and a scuttle. It had become harder and harder to stifle her tears and fears from the recession. She had owned this travel agency for more years than she sometimes cared to remember. Today was one of those days when it was best to forget. “And they say lobsters don’t feel pain,” she muttered. But just when it seemed she was staring down a pot of boiling water, Trixie saw two customers glide into her office with plenty of plankton to spare. “The continental shelves are just teaming with life this time of year,” Trixie offered with an enthusiastic smile. Lily’s calico shell shuddered. She tilted her body and clicked her claws. Lily did not like the sound of this. Comfort was what she craved. “What about one of our luxury expeditions to Prince Edward Island? The waters are absolutely stunning and trap free. Have you been?” said Trixie, clawing over a brochure. Trixie lifted a large conch to reveal a whole slew of pamphlets featuring exotic package tours in every imaginable corner of the Atlantic. “You want thrilling? We have it!” boasted Trixie. 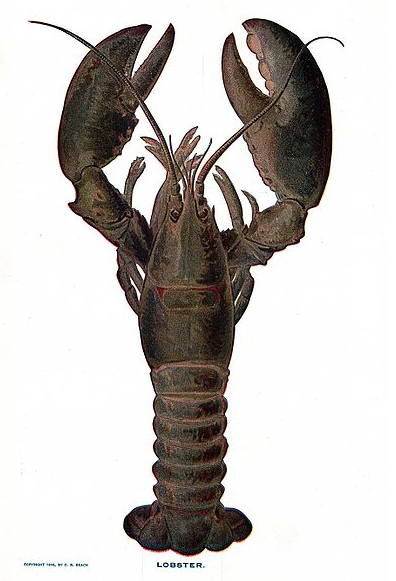 From the sudden stillness of his wife and the amplified clattering of the lady lobsters at their desks, it was as if Crusty dropped a limb. Lily stared at Crusty’s graying eyes, the one noticeably smaller than the other. He had lost his left eye after spiraling into an agitated blowfish at an all-you-can-eat fish bar after one too many Rob Roys and tossed punches with some impolite prawn who had insulted her honor many years ago. His small regenerated eye always evoked feelings of sympathy for her husband when she gazed upon it. But not now. “You want to go where?” she cried out. Trixie turned from her normal rusty orange color to a foreboding shade of bisque. “There’s romanticism, dearest, and then there’s suicide,” Lily replied, though her single-chambered heart undeniably softened. “If I die trying, so be it.” Crusty reached out his claw. Lily hesitated. Crusty was prepared to accept his wife’s decision to remain underwater. It was only natural, for Neptune’s sake. You couldn’t expect to change 500 million years of evolution in a moment, albeit a passionate one. He turned and slowly glided toward the door without looking back. “Wait!” Lily shouted. She slid up next to Crusty and clasped claws. Half a century with Crusty was the best holiday any lady lobster could ask for and she would never forgive herself for missing out on the final part of the journey. “Come on, you old soft shell,” she said. “Land, ho!” Tails raised, Crusty and Lily ventured off. “Bon voyage,” offered Trixie, wistfully watching the couple as they swam away. In all her years she hadn’t seen anything like this. Ever felt the odd-placed joy of not making a sale. It wasn’t by far a banner business day, but somehow, someway, everything was going to be okay.